Soundtrack from the video Guitar Drag, 2000. Recorded in San Antonio Texas, on 18th November 1999. Cover design by Ellinor Gylling with stills from the video. Guitar Drag by Christian Marclay is now being released on Neon Records. 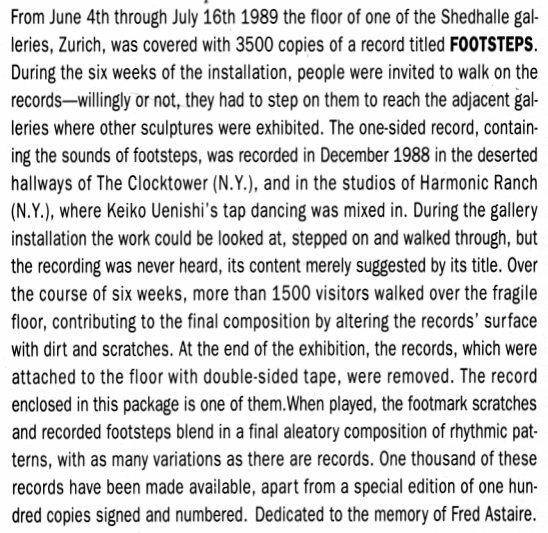 The record is actually the sound track for Marclay's video with the same title that was shown first at London's Hayward Gallery sound art exhibition ìSonic Boomî in 2000. 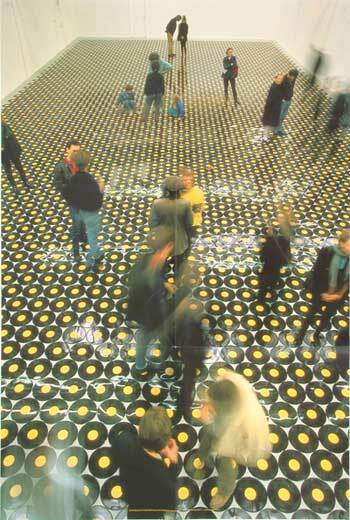 The piece as well as Marclay has become an icon in sound art circles, and although the video can only be seen in exhibitions as an installation, it is widely known. The full 14 minutes sound track is released on a beautiful 12'' clear vinyl record packaged in a sleeve with stills from the video. Filmed in San Antonio Texas, it shows an amplified Fender Stratocaster guitar attached to a rope being pulled behind a pick-up truck. As the guitar drags across the road it produces a range of sounds from the bumping and the friction against the varied surfaces. A fantastic visual piece, but also an amazing sound piece, that stands just as well alone, and in some ways just as visual! From the first sounds of duct-tape being ripped, the familiar sound of someone gently slamming the strings of the guitar, to the sounds of an engine starting and then slowly the beginning of a sound that is hollow and at the same time human, and that takes us through the deepest roarings to high pitch screams until the very end when it all slows down and stops, unwillingly it seems. Knowing the story behind the work or not, the sound itself triggers your imaginaton, leaving your soul no peace. For even if this could be seen, or heard, solely as a beautiful noisy sound piece, there is too much to the idea behind Guitar Drag, for it to not leave you restless and thoughtful. Guitar Drag has many different layers of references, it alludes to the ritual of smashing guitars in rock concerts, it recalls Fluxus and its many destruction of instruments. It is also like a road movie, with reference to the landscape of Texas where it was filmed, with references to cowboys and rodeos. It is about violence in general and more specifically about the lynching of James Byrd Jr. who was dragged to his death behind a pickup-truck. I want the video to have these multiple layers and trigger people's imagination in contradictory ways. The piece ends up being seductive and repulsive at the same time. One-sided LP, made to accumulate surface noise.